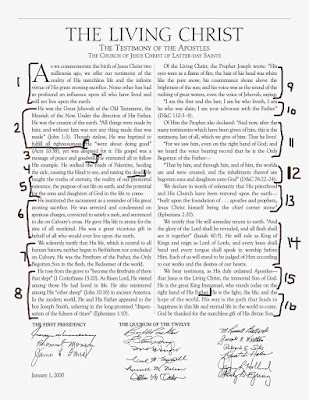 Our Little Family: Tips for memorizing "The Living Christ"
Tips for memorizing "The Living Christ"
Several years ago I memorized "The Living Christ" for a project when I was a young woman leader. It was such a great experience for me. I knew that I would need to review it often to be able to remember it and I have gone up and down in that resolve. Last year after a talk in the Women's general broadcast, I decided to get serious and rememorize it again. Since I had already memorized it before it was quite easy to pick up on it again once I got going. This Christmas I have been review it again and having such a wonderful experience "ponderizing" it this time! So tonight as I was thinking about it I felt a sudden push to write about how I had memorized it and share it with others. I resisted that feeling thinking that no one would care but I kept feeling that push so here I am. I own the credit to my wonderful Mom for helping me get the materials together to memorize it. She was also a Young Women leader at the time and she was helping her girls to memorize it. So she had divided the Living Christ up into 16 parts. They were printed out on paper and cut up to about 4x6 inch sizes for each of the 16 parts. I got a little photo book, the dollar kind you can get at Wal-Mart. I put one paper on every other page and then on the blank page next to it, I put a picture of Christ that correlated with the words on that page, or just a picture of Christ if I couldn't find one that correlated. I found most of my pictures from old Ensigns. I think one of the things that helped the most was having the pages numbered. Remembering the page number helped me memorize in parts and I came up with little tricks to help the page number trigger what the pages topic was. Hope that makes sense, I don't know how to word that better...For example page three starts with "He Went" so I would hold up three fingers and it would also make a "W" in sign language and that would help me remember how the rest of that part went. Page four starts with "He Entreated" and I would hold up four fingers and then make an "E" in sigh language to remind me of the word "entreated". Here are a few pictures so you can see what my book looks like. My booklet isn't too fancy and my pictures here are even less fancy but hey, you get the idea! The first page has the entire thing, just small! Here is a very professionally done way of showing you how it was divided up. You are of course welcome to divide it up in any way that you like. This is just what I did (or my Mom rather :) and it worked really well. I love having this memorized! When I can't turn my brain off and fall asleep at night I begin to recite it to myself and I am usually out cold by the 3-4 stance! 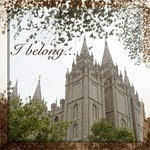 I also love to take it in my church bag and read it during the sacrament. My kids also like to look at the pictures during the sacrament. 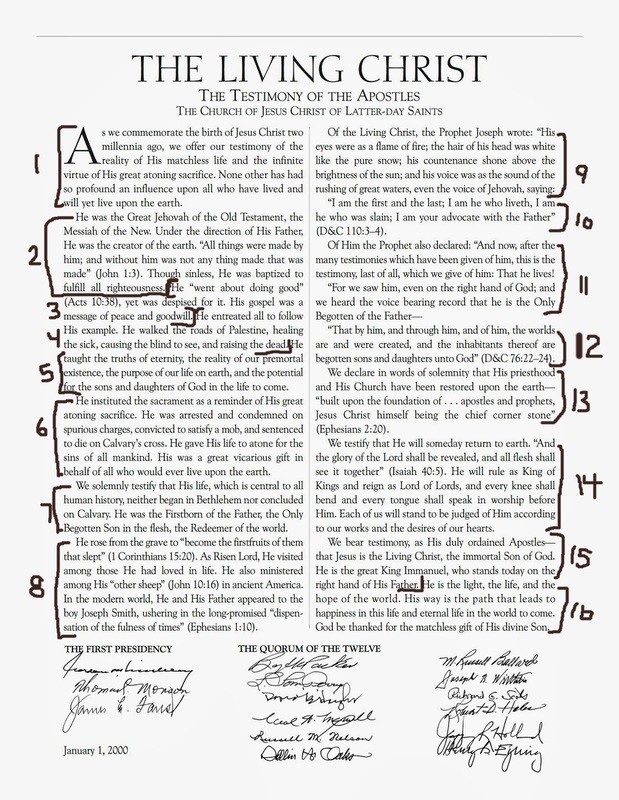 I feel closer to my Savior as I memorize, ponder and recite this inspired document! I love my Savior, Jesus Christ so much and I am so grateful for all He has done and continues to do for me and all mankind! I would love to hear your feedback, thoughts and experiences if you have memorized this already too!